Madeline Tiger’s recent collections are Birds of Sorrow and Joy: New and Selected Poems, 1970-2000 (2003), The Atheist’s Prayer (2010), and From the Viewing Stand (2011). 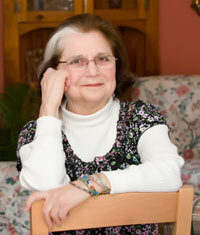 Her work appears regularly in journals and anthologies. She has been teaching in state programs and private workshops since 1973 and has been a “DodgePoet” since 1986. She has five children and seven grandchildren and lives in Bloomfield, NJ under a weeping cherry tree.